On August 5, 2004, I received a call from a DJ in Vermont, "Hi Mr Breakfast. It's National Waffle Day today. I was hoping we could talk to you about it on the air". Honk! I squeezed my nose and made a funny noise. He had the date wrong and I had no game show-style wrong-answer buzzer. It's understandable that the dates for Waffle Day might get confused. In fact, there are two very similar sounding holidays. 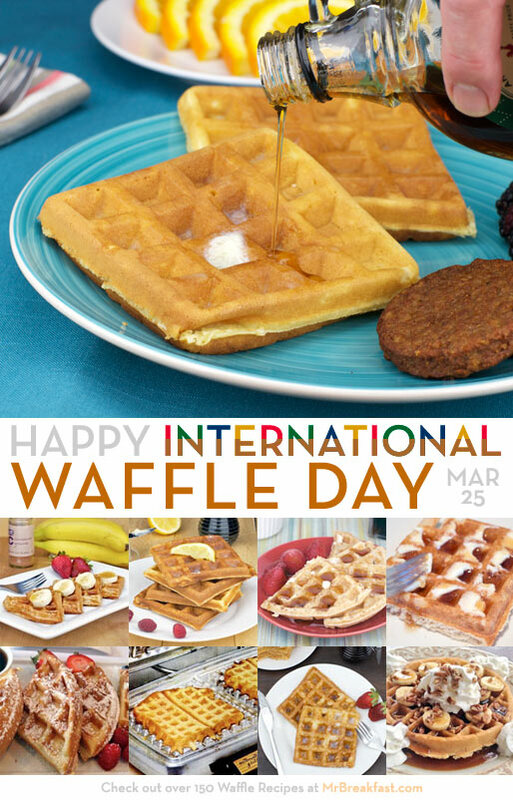 International Waffle Day on March 25th and National (U.S.) Waffle Day on August 24th. The mistaken August 5th date appears to have stemmed from a teacher's lesson plan about unique holidays. It was distributed widely over the internet and undoubtedly my DJ friend came across a later generation of this wrong information. Whip the egg whites to form stiff peaks. Set Aside. In a medium bowl, stir together melted butter, sugar, vanilla and milk. Beat egg yolks and add to the mixture. Add flour. Stir. Add mashed bananas. Stir. Finally, fold in the beaten egg whites. Top completed waffles with fresh sliced strawberries (or jam), whipped cream and chopped pecans. Serve with melted butter and syrup, if desired. International Waffle Day (March 25) originated in Sweden where it is called Våffeldagen. It occurs nine months to the day before Christmas - the day the Archangel Gabriel told the Virgin Mary that she was pregnant. As the holiday progressed, it also began to commemorate the first day of spring. Waffles come into play because on March 25th the women of Sweden would set aside their winter tasks like chopping wood and knitting, and began their spring tasks... the most notable of which was preparing waffles. National Waffle Day (August 24) is the anniversary of the first U.S. patent for a waffle iron. Cornelius Swarthout of Troy, New York received his patent for a "device to bake waffles" in 1869. His early waffle iron was used in conjunction with coal stoves, consisted of a griddle and a cover and required flipping of the device to cook both sides of the waffle. 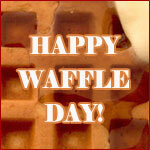 At present, National Waffle Day is at best a "bizarre" or "unique" holiday" - the fluff stuff of radio DJ commentary. Waffle promotions at some restaurant chains have helped to keep the holiday alive, if only barely. Late 1800's - Thomas Jefferson returns to the U.S. from France with a long handled, patterned waffle iron. Heck with it. Since the dates are screwed up anyway, we may as well celebrate waffles any day we want. Here are a 150 waffle recipes. You and I can celebrate Waffle SEASON - 5 months worth of waffles! You see - we're breakfast buddies - the best buddies of all - united under the puckered ridges of waffles - we can do whatever we want! And since we ARE so close - could I borrow twenty dollars? Please quit squeezing your nose. I live in Sweden, and when I read this, I couldn't help but goggle at the screen. I am sorry if my English is bad, it is my fourth language (we learn it in school from the age of six). Anyways, I realize that I shouldn't come to you complaining about spellingmistakes, but when you say something is called something in a language, you can't just type something that's almost horrible wrong. Even if your browsers can't take the special Swedish letters "�", "�" and "�", you should STILL type them and then type "a,a" and "o" between parantheses. It's NOT spelled "Vaffle-dagan".. that is like spelling "The United States of America" as "tha Onitad State uf Merica". See what I mean? The PROPER spelling is "V�FFELDAGEN" and it's spelled like one word, if you can't see the "tricky" letter "�", then here comes the proper spelling without the Swedish dot over the "a": VAFFELDAGEN. I don't quite get what you mean by: "It occurs exactly nine months to the day before Christmas." Bebadelsedag as it is called in Sweden is ALWAYS on the 25th of March, that is also the heathen traditional day of (I think that's the right word) v�ffeldagen. So, if I understood what you wrote right, then you say that Maria Bebadelsedag is the 24th of August? But that is not true, since it's the 25th of March. You are right that v�ffeldagen (vaffeldagen) is the turning point and that it means spring is on the way. But you know, the women of Sweden did "chop and knit" all year around, so please don't state such things, just say something like "start their spring chores/tasks." Wow! Thanks for your letter. You've certainly enlightened me regarding those little dots and whats-a-whos-a's over Swedish vowels. If you will look above, I've changed "Vaffle-dagan" to "V�ffeldagen". For the sake of providing an explanation to our English-speaking audience that is easy-to-understand, I've decided to keep the wording "nine months to the day before Christmas", but I have removed the word "exactly". I understand your concern. It seems to be a matter of how you look at the word "month". Taking "month" as a collection of days, it is inaccurate to say "nine months to the day". However if we take "month" as an individual unit, as in "twelve months comprise a year", it become reasonable to use "nine months to the day" when describing the span from March 25 to December 25. It's my hope that breakfast lovers will read this transcript if they consider Waffle Day as important as you and I.
I have to stand by the dates March 25 for International Waffle Day and August 24 for National Waffle Day. You may not have understood that I was writing about two separate holidays due to the language difference. Regarding your concern over the phrase "the most notable of which was preparing waffles." It would be clearer if I wrote "the most notable - in terms of why the holiday is a waffle holiday - was preparing waffles." However, I believe that additional explanation is implied by the nature and title of the article. I will admit that I've simplified the degree to which Swedish women "chop and knit". As an author, one of the first things I have to decide is "what kind of an article am I writing?" The Waffle Day Controversy is an example of what we call "fluff" journalism. You can compare this to "hard-hitting" journalism by looking at the article Breakfast On Death Row. In a fluff piece, exact facts are often compiled under an umbrella of symbolic-representative fact in order to achieve the author's point quickly without being deceptive. So while I appreciate that Swedish women did - and many still do - chop and knit year-round, I've decided to retain chopping and knitting as tasks symbolic of winter. It is with regret that I have to say I don't understand your question or point about drinking from an inverted bottle. If you're asking for the term we might use in the United States, I'd suggest the words "chug" and "guzzle". Thank you very much for your letter. It's challenges like yours that force me to earn the title of "the world's undisputed #1 expert on breakfast". It reminds me that a "title" - in the truest sense of the word - is a verb. So I guess there's only one thing left to say. Happy V�ffeldagen!